Masada pronounced Metzada in Hebrew is an ancient fortification in the Southern District of Israel, on top of an isolated rock plateau on the eastern edge of the Judaean Desert,overlooking the Dead Sea. 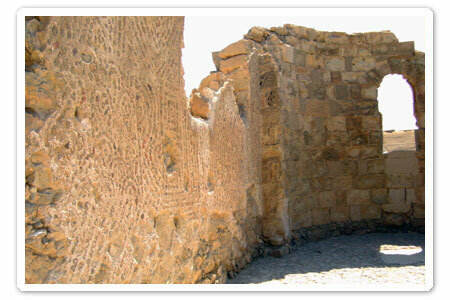 Herod the Great built palaces for himself on the mountain and fortified Masada between 37 and 3l BCE. 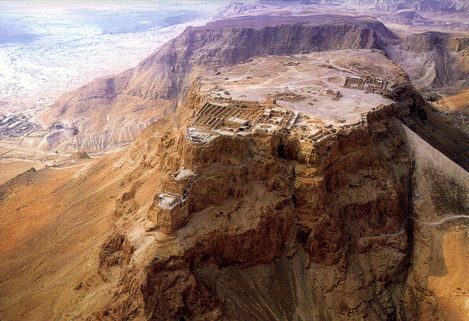 The site of Masada was identified in 1842 and extensively excavated between 1963 and 1965 by an expedition led by Israeli archaeologist Yigael Yadin. The Roman ramp still stands on the western side and can be climbed on foot. Many of the ancient buildings have been restored from their remains,as have the wall-paintings of Herod’s two main palaces, and the Roman style bathhouses that he built. The synagogue, storehouses, and houses of the Jewish rebels have also been identified and restored. The metre- high circumvallation wall that the Romans built around Masada can be seen together with eleven barracks for the Roman soldiers just outside the wall. Water cisterns two-thirds of the way up the cliff drain the nearby wadis by an elaborate system of channels, which explain how the rebels managed to conserve enough water for such a long time. The skeletal remains of 28 people were unearthed at Masada. 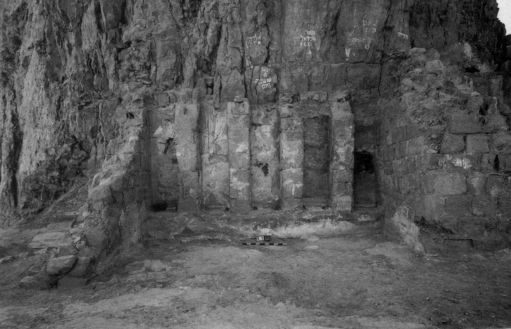 The remains of a male 20 – 22 years of age, a female about 17- 18 and a child approximately 12 years old were found in the palace. The remains of two men and a full head of hair with braids belonging to a woman were also found in the bathhouse. Forensic analysis showed the hair had been cut from the womans head with a sharp instrument while she was still alive ( a Jewish practice for captured women) while the braids indicated that she was married. 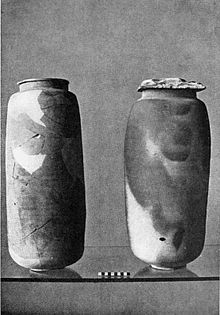 Based on the evidence, anthropologist Joe Zias believes the remains may have been Romans whom the rebels captured when they seized the garrison. The remains of 25 people were found in a cave at the base of the cliff. 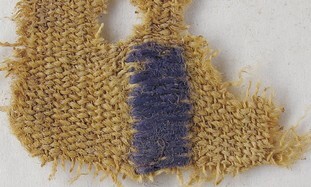 Carbon dating of textiles found with the remains in the cave suggest they are contemporaneous with the period of the Revolt and it is believed that as they were buried with pig bones ( a Roman practice);this indicates that the remains may belong to Romans who garrisoned Masada after its recapture. Others,however still maintain that the remains are those of the Jewish Zealots who comitted suicide during the siege of Masada,and all were buried at Masada with full military honours on July 7th 1969. The excavators fully revealed virtually all of the structures built by Herod the Great in the second half of the lst century BC.These included massive storerooms, a large bathhouse, an administrative building, an apartment building. 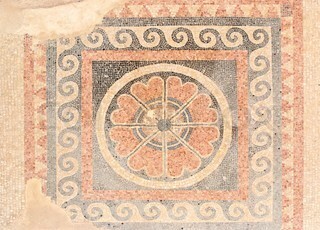 Many of the rooms were decorated with collonnades, stucco- work, fine mosaics, and brightly coloured frescoes. 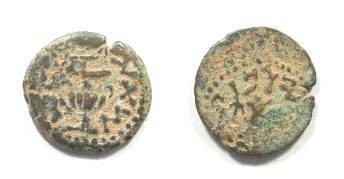 Yet more important,however was the abundant evidence for the Zealot occupation during the revolution of AD 66-73. Excavators found improvised living quarters in and adjacent to the casement walls around the top of the plateau. 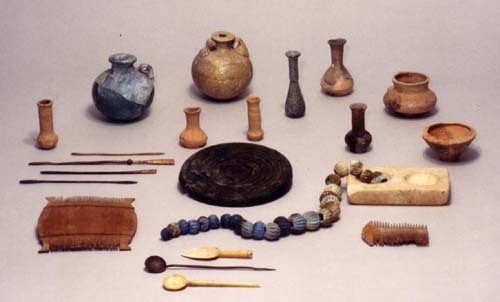 Much of the debris – pottery, coins,bone utensils,soft stone vessels, basketwork, leather sandals, even plaits of human hair- bore testimony of the simple life of the peasant-revolutionaries represented. A view of the remains of Herods library. Among the discoveries were some fragments of scroll, including one bearing part of a passage of text otherwise unknown except in the corpus of the Dead Sea Scrolls.This was highly significant as it provided a direct link between the religious radicolism of the scrolls and the political action of the Jewish revolutionaries, allowing us to treat the former as a reliable guide to the mindset of at least some of the latter. The scrolls can now be used with confidence to shine a beam of light on the motives of the Zealots and other groups engaged in the struggle against Roman imperialism. As for the Herodian remains,the expense,luxury, and Classical taste revealed, simply confirm the huge golf both social – and cultural- which separated the Jewish elite from the Jewish masses, a gulf that surely made revolution far more likely.